Updates on the XC season from members. I have been a competitive runner for over 30 years. That in itself should signal that perhaps it is time to throw in the towel, retire, learn to cook, start a book club, anything other than race. It’s kind of like a gambling problem. I run, it hurts and it’s slow(er). I try again: It still hurts and it’s still slow(er). Then one day I get a payoff. I have a great workout. I hit the times I used to hit and I actually feel good! So I continue and then the pattern repeats itself. These payoffs get fewer and further between. I am almost broke (back to my gambling analogy) and ready to walk away, but then boom — payoff! Maybe not as fast as back when, but it sure feels good and I continue running with aches and pains and slower and slower; waiting and waiting for the next big payday. I tell you this not for sympathy by any stretch, as none is deserved or needed. I tell you this because despite the clear fact that at 50 years old, I have reached and surpassed my running “Best By Date” and am learning to be OK with this fact. I am fairly new at learning to be OK with slowing down so forgive me if I act like a whiner. I don’t want to be one of the people who talk about the “good old days” because I am still not convinced those days are 1) behind me, and 2) that they were any better than these days. The hour I spent running 10 years ago may have felt better and I could cover more ground in that hour than I can today. But that was only one hour of my day and I hope that one hour doesn’t define my entire day or represent me as a person. Sometimes I can’t help that it does, and so, as I become more accustomed to slower times, I need to work on making certain I become detached from the outcome of my runs. That was until I turned 50. And then I was catapulted into caring again about the outcome of my runs and races. I had a whole new set of records and races to conquer. That is the beauty of cross country. I could race with my people — other old broads who can’t break the habit — and have a fighting chance of placing high. I tell you it’s an addiction! So it was with great delight that last fall the Empire Runners put together a very strong senior women’s team to compete in the cross country season. My training had new meaning and intensity. I was motivated to place high individually in the season and even more motivated to help our team place high. I became disciplined with my workouts and diet and for 12 weeks last summer and fall, I followed a training program featured in a running publication which was ironically designed by our biggest cross country rival, The Impalas! The hard work paid off and I had a very successful season as did our team. I went undefeated in the cross country season, won the old gal division at the San Jose Rock n Roll half marathon, which qualified me for this year’s New York City Marathon. 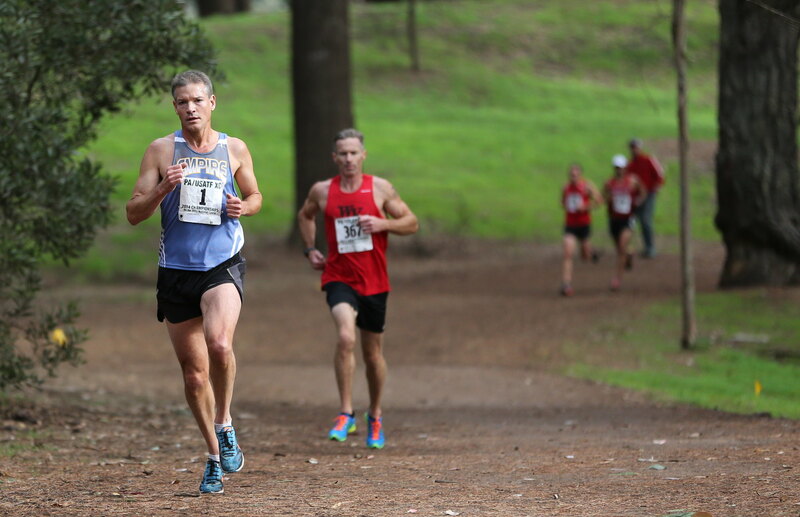 I helped break the 50-plus mixed male and female record at The Valley Ford Relays and my advanced age allowed me a nice head-start on the Loop de Loop, which resulted in an overall win. This 50 thing ain’t so bad. Sure, the Best by Date has come and gone. But that doesn’t mean you can throw me out just yet! 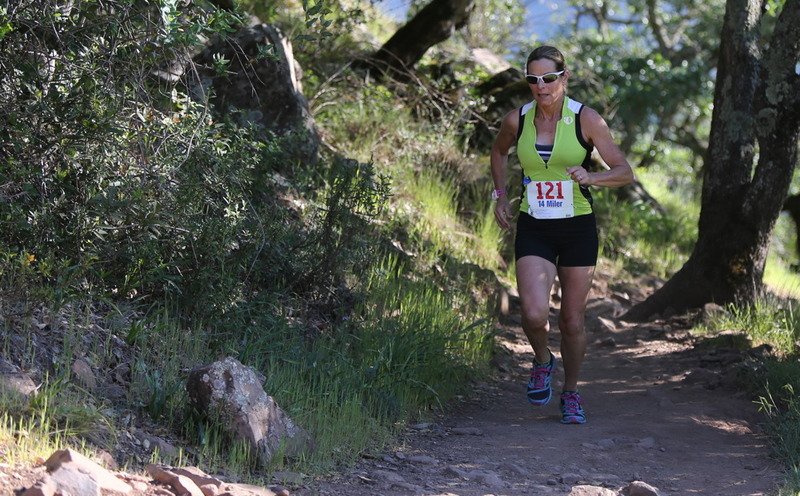 Hope to see you on the roads, trails and starting lines! Cathy Dubay was named the Outstanding Female Runner of the Year for the 2014 Cross-country Season. 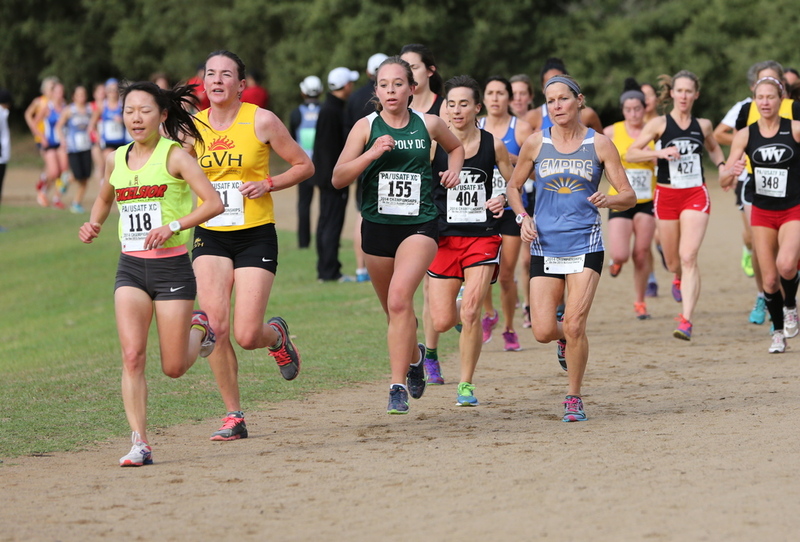 In all six races in which she ran, Cathy came first in the Senior Women’s Division – a perfect score which garnered the most individual points possible. As if her racing talents aren’t enough, her enthusiasm and support helped build a roster of 16 Senior Women. Dale Peterson is a bedrock member of the Empire Runners. He had been an active XC team member until injuries got in the way. He has retaken the trails doing more marathons and long distance races. Along the way, he became a certified USATF official. As such, he has helped at many Pacific Association XC and Road Races joining Bob Shor (whom I’ll get to in a moment). “Dale doesn’t realize it, but he’s good at being an official. Very good.” – Bob’s words. Accordingly, the LDR voted Dale the Volunteer of the Year for the 2014 XC Season. As for Bob Shor, he is a fixture at any running event. He thoroughly loves officiating. His dedication is unparalleled. And anyone who has experienced Bob’s mastery in person knows “We run on time.” Bob works tirelessly for any event he participates in. For this service, the LDR voted Bob a Lifetime Achievement Award. It doesn’t mean he’s going anywhere soon. He still loves what he does. Except now everyone knows what we have always known – we have a legend in our midst. Congratulations, Cathy, Dale and Bob! While our cross-country season can be one of the most enjoyable racing experiences available, combining the camaraderie of team competition with the diversity of trail running, it can also be the most challenging. Such is the depth of our cross county circuit that a performance that would rank in the top five at a local road race may not be enough for a top 30 finish. Nothing can enhance your experience like PREPARATION and the time to start preparing is in June. In my next blog post I will discuss summer training for the cross-country season.